It’s frustrating when you work really hard only to realize later that you were operating WITHOUT all the necessary information, isn’t it? Unfortunately, I see this all too often when it comes to the FODMAP Diet. Psst! 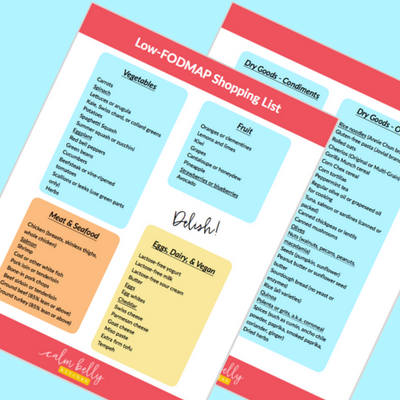 If you’re ready to get started, click here to receive my complete FODMAP reintroduction plan, checklist and food tracker. While I believe it's important to cover what not to do, it's even more important to know what you SHOULD be doing to make the process as smooth as possible. That's why the goal for this post is to give you my top tips that'll make your life easier AND prevent you from falling victim to the most common reintroduction pitfalls. Study these tips, especially if you’re just getting ready to start FODMAP reintroduction. #1 Choose test foods that contain only one type of FODMAP. You do NOT need to test every high-FODMAP food under the sun--Instead, you’ll choose one test food from each FODMAP category. Your response to these test foods will be an indicator of your general tolerance for that category. Cool, right? For example, honey is a good test food because it only contains fructose. Apples are not because they contain both fructose and polyols. Use the Monash app to determine your test foods. Whenever possible, choose a test food you enjoy and want to add back to your diet! Need a list of high-FODMAP foods organized by category? Just click here and we’ll send it directly to your inbox free! #2 Continue to eat a low-FODMAP diet throughout the reintroduction process. This ensures that you’re collecting the most accurate data about your FODMAP tolerance levels as possible. Wait until you’re done testing all the FODMAP categories to permanently bring back the high-FODMAP foods you DO tolerate. Not sure if you’re ready to reintroduce FODMAPs? Read this post that covers 3 simple ways you know it’s time. It’s helpful (but not required) to track all your food because it keeps you focused on maintaining a low-FODMAP Diet. If you’d rather not track everything, you must track your test foods/amounts and any symptoms. You’ll use all this data as your guide when you start bringing other high-FODMAP foods back into your diet. Choose whatever tracking method you’ll use consistently. A spreadsheet, notebook, Word doc, the MySymptoms app, or the My Fitness Pal app are all great options. #4 Wait 24 to 48 hours before increasing the serving amount of your test food OR testing a new FODMAP category. Symptoms can happen as late as 48 hours after eating a high-FODMAP food, so this ensures no lingering symptoms interfere with your next test. As you get comfortable with the testing process, you’ll learn when symptoms typically show up, if you get any symptoms at all. Remember, you might discover one or more FODMAP groups that you tolerate really well! #5 Make the testing process flexible. If you have an event where you're unable to avoid high-FODMAP foods, take a break from testing and continue as soon as any symptoms resolve. Pause your testing for vacations or holidays. Plan it to fit around a busy work week or other commitments. If you’re ready to get started, click below to get my complete reintroduction checklist. It’s what I use to make sure my clients are successful from day one. You’ll also get my reintroduction planner and tracker to help you get AND stay organized. Click to get the FREE Reintroduction Checklist and Tracker! Just like you wouldn't travel without GPS, don't start the FODMAP Diet without a plan. Learn common challenges others have faced AND how to overcome them. When you start the FODMAP Diet, the goal is to hit the reset button on your body by eliminating as many high-FODMAP foods as possible. But how do you know when it’s time move out of that restrictive phase and bring FODMAPs back into your diet? And how do you reintroduce FODMAPS? It’s not about a certain period of time, and it’s definitely not about being 100% symptom-free. Instead there are 3 specific factors that let you know when to test your FODMAP tolerance so you can eventually enjoy a whole lot more variety in your diet. Keep reading to learn if it's time for YOU to test FODMAPs. Or watch this episode of Calm Belly TV to go even deeper. I cover the 3 factors in about the first 10 minutes, but if you’re not pressed for time there are some great Q&As from the live viewers! Ready to challenge and reintroduce high-FODMAP foods? Click to get your FREE Reintroduction Checklist! When is it time to reintroduce FODMAPs? In other words, you’re really good at doing the elimination phase, and you know what your body feels like when you have maximum symptom control (remember, that doesn't necessarily mean being symptom-free - see #1). This is important so you can recognize reactions when you test high-FODMAP foods in the reintroduction phase. 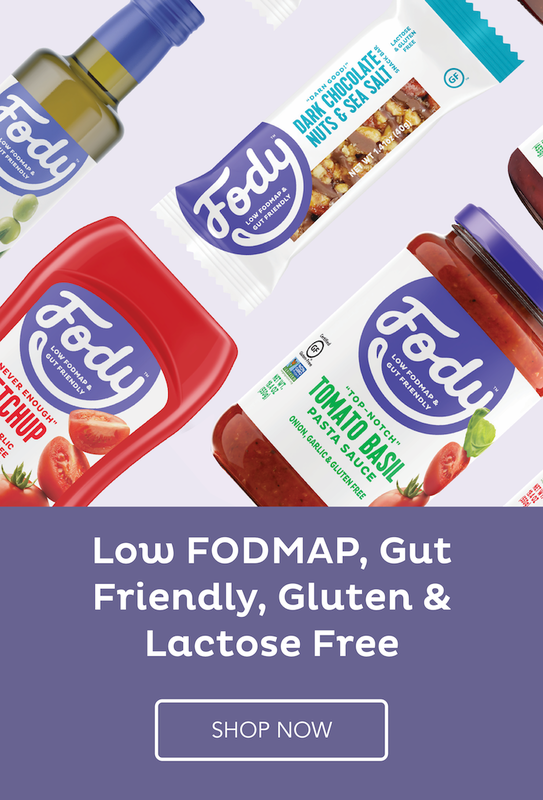 >>> All of the above means you’ll be able to easily test your FODMAP tolerance for those high-FODMAP foods without the stress of what to eat the rest of the time. It’s also a helpful skill because you can fall back on it during stressful times or health challenges that might come up in the future. When you can check off the 3 items above, it’s time to move onto the reintroduction phase and test your personal tolerance to the various types of FODMAPs. Most people with IBS can add certain high-FODMAP foods and categories back to their diets and still feel great. But the only way to know which FODMAPs are your friends is to test! How FODMAP Changes Your Life - Client Success Story! You’re more empowered when it comes to IBS than you’ve ever been. This is awesome. But where do you go from here? How do you know you’ve been successful? When are you actually finished? The end goal of the FODMAP Diet is rarely explained. If it’s not supposed to be a lifetime diet, what should you be eating for the rest of your life? Short answer: You should bring as many high-FODMAP foods back into your diet as you can while keeping your belly happy. Today, I want to give you a simple framework to go from, “What’s next after to FODMAP,” to a lifetime eating style you love. Testing each FODMAP category through the reintroduction process helps you determine your tolerance level for ALL the foods in that category, but how much should you eat? Go through the Monash app. List out the high-FODMAP foods you can bring back into your diet and an estimated serving size based on your tolerance for that food’s category. If you had a moderate tolerance for wheat and want to eat rye bread, start with one slice. If you have no issues, you might try two slices next time. Do this with all the foods you love. You can take a casual approach, or add one new thing every other day. Soon, you’ll know the portion sizes that work, and you can start enjoying them regularly. Now that you’ve brought back the foods that don’t trigger your IBS, it’s useful to understand how many high-FODMAP foods you can tolerate in a day or in single meal. Do some experiments. If you have a moderate tolerance for wheat, can you eat toast at breakfast, half a sandwich at lunch, and a serving of pasta for dinner? At this point you’re regularly enjoying high-FODMAP foods in the amounts you can tolerate. If your IBS symptoms are fully in check, fabulous! If you have symptoms more than you’d like and can’t link them to a specific food, then take a look at other things that impact digestion. For example, have you started eating larger portions? Are you skipping meals or eating late at night? Have you stopped exercising or moving as much throughout the day? Have you started a new medication or supplement that might be causing side effects? The FODMAP Diet tends to be all encompassing. Giving it your focus likely helped you succeed, but that probably forced you to put everything else on the back burner. The momentum you’ve built by taking control of IBS puts you in the perfect position to tackle a health goal you’ve put on hold for months, maybe even years. Do you want to finally get to your happy weight? Kick sugar? Go vegetarian? Keep refining your lifetime eating style? Now's the time to go for it! If you're ready to create your lifetime eating style or tackle a NEW health goal ASAP, save time and get valuable support in Calm Belly Club, our members-only online community. As a member, you get access to Free To Eat, my comprehensive guide to the reintroduction phase! During a group coaching session recently, one of my awesome clients asked if I had a great low-FODMAP pizza recipe that wouldn't trigger her IBS symptoms. I said no because I only use ONE recipe: my favorite classic, chewy-crispy, stone-fired pizza dough. “So what gluten-free flour do you use?” Another client asked. When I clarified that I use regular all-purpose wheat flour for my pizza, minds were blown. In that moment a light-bulb went on in my head: No one talks about life AFTER the FODMAP Diet. You might not know you can bring certain high-FODMAP foods back into your life because nobody bothered to explain it. You might know about avoiding high-FODMAP food and testing FODMAPs (i.e. the Reintroduction Phase), but what about the end goal of this process? To put it plainly, less FODMAPs = less IBS symptoms isn’t the full story. The end goal is to eat some pizza, or crisp apples, or ice cream - or whatever food you’ve loved and lost! The end goal isn’t to restrict all high-FODMAP foods forever. The goal is learning your unique triggers for your IBS symptoms. Testing FODMAPs and learning their personal triggers is how these ladies went from anxiety and restriction to having fun eating again. And it doesn’t take tons of time or willpower to test FODMAPs. The key is to create your testing plan, set a date, and track your results. In case you missed it, I designed a tool to make this quick and simple. Click here to get the FREE Reintro Checklist and Tracker for the FODMAP Challenge Phase! Avoiding every high-FODMAP food 24/7 is good when you use it for a purpose: Learning about your body and giving it a clean slate. Kind of like hitting the reset button. But if you’re doing it with no purpose or end goal, you’re depriving yourself of a huge variety of food when it’s not necessary. Going through the process and testing the different FODMAP categories is worth it because of what you get in the end: You know what triggers your IBS and what doesn’t so you’re free to eat without fear. It can feel like discovering the FODMAP diet is what changes your life, but it’s not. Knowing your triggers is what changes your life - It breaks you out of food jail and leads you to freedom. And if freedom looks like pizza to you, you owe it to yourself to find out. Help spread the word...Share it on Pinterest! When you take away high-FODMAP foods and get relief from your IBS symptoms, it feels pretty amazing. You work hard to eliminate every possible FODMAP ingredient from your plate so you can keep feeling good. You avoid going to restaurants whenever possible and turn down social meals. You’re good at planning and cooking your own food, but the effort is exhausting and you wish you could just pick up pizza once in awhile. It seems like you can count your “safe” foods on two hands, and stressing over every bite is wearing you down (or making you want to binge on Mexican). Right now you’re missing out on delicious food, and you don’t need to be. There’s a way out of this lonely, hungry place and it’s all about finding your unique IBS triggers. I’m here to tell you finding your triggers isn’t as difficult as you might think. It’s even a little fun, especially with this handy tool I created to help you along the way! If those statements describe you, you’re ready to bring back FODMAPs and learn your unique triggers! Through the Elimination Phase you gave your body a clean slate. Now it’s time to learn what FODMAPs are the culprits for YOU specifically - and which ones can be part of your life again. When I coach people through FODMAP testing, we approach it like an experiment - You’re collecting data about your body in an organized process. In the end, you use all this awesome info to create your unique lifetime eating style so you can stop policing every bite and start enjoying food again. Having a simple tool to track your food testing results is essential. Why? It lets you see patterns in how your body reacts to different FODMAPs. It clearly shows you how long it takes for symptoms to pop up - many people notice that it takes 1 to 2 days. This info is gold! For every FODMAP category you test, you’ll start with a very small serving (so you’re never blindsided by major symptoms) and work your way up to a large serving. You already know that FODMAP testing is the way to more food freedom - but it can be overwhelming, so I created a free Test Food Tracker that you can download and get started as soon as today! It’s the same tool I use in my program Free To Eat, which guides you through the FODMAP reintroduction phase (Become a member of Calm Belly Club to get access to this program!). This Tracker is a workbook that you can fill out on your computer (just save it to your device and you’ll be able to type into it), or print it out and write on it! As an extra bonus, I added a cover page that helps you design your personalized testing plan. There’s also a place to fill in your start date - Put it on your calendar and commit to it. Remember, it’s not healthy (for your body or your social life) to stay in a strict elimination diet for more than a few weeks. More importantly, it’s not necessary! Download the free Test Food Tracker and start planning. If I’d never learned my unique IBS triggers, I wouldn’t have known it was okay to eat my favorite pizza dough again - wheat is NOT one of my trigger foods. Having more freedom and less stress in my diet was totally worth the effort, and that’s what I want for you too! Most of my health coaching clients are fearful of mistakes when they first get started with the FODMAP Diet and take food away (aka the Elimination Phase or FODMAP Challenge Phase). While this first part of the diet takes some getting used to, I see more mistakes happen in the crucial testing process (bringing foods back in to find out what you can eat and still keep your IBS in check). If you've come up against any of the snafus listed below during your elimination, don't feel bad! This FODMAP challenge phase has a learning curve, but it shouldn't take a PhD in food science and the steely resolve of a navy S.E.A.L. to get your FODMAP situation sorted. So to de-mystify this whole process, I want to dig into the biggest mistakes I've seen and how to avoid them. Sure, it’s okay to have questions (I guarantee you’ll have questions!) about the testing FODMAPs, but don’t spend too much time thinking about every little thing you could do wrong. Not eating the correct amount of a test food - The amounts are guidelines, so you don’t have to measure down to the gram. If you’re testing ¼ cup of onion, yes it’s okay to use 1 cup of onion in a big ‘ol stir fry and eat about one-fourth of it. Raw or cooked? Canned or fresh? - It depends on the food, but whatever you choose to test with, be consistent. If you’re testing lactose, don’t have yogurt one day and drink milk the next. What if I don’t like the test food? - You’ve never eaten a mango in your life and you don’t plan to start now. That’s okay, but you’re not testing mango, you’re testing fructose. (If that just blew your mind, stick with me.) Mango is a great test food because it contains high levels of fructose and no other FODMAPs. Your reaction tells you if your belly gives fructose the thumbs up - or not so much. What happens if you test a high-FODMAP food and the results don’t make sense? There are lots of possible reasons for this (work stress, anxiety about symptoms, your period, other foods...). If this happens, you haven’t hit a brick wall - you can just retest it. This is a part of the testing process that doesn’t get talked about much! Don’t worry, most of my clients don’t test foods multiple times. But once in awhile your symptoms go wonky - maybe your belly rumbled like crazy after a smidge of garlic, but you had no issues when you indulged in a big scoop of garlic-y marinara sauce. If the data doesn’t add up, it’s not a danger sign that you should give up and abandon garlic forever. You either test again right away, wait till later, or even try another test food in the same FODMAP group. Easy! Ready for FODMAP Reintroduction? Grab your free checklist and tracker! You might have symptoms within a couple hours of eating a test food. Bloating can happen relatively quickly. But diarrhea or constipation may not hit you for 24 to 48 hours, since gut transit times are different for everyone. If you test honey and feel great the rest of the day, you’re in the clear, right? Maybe. You may have read that it’s wise to test a high-FODMAP food on consecutive days, but I've seen better results for my clients when you give it more time and keep track of how YOUR unique IBS symptoms tend to play out. Moral of the story: Listen to your body. It’s okay to test FODMAPs even if you have IBS issues occasionally. Most people do NOT have all their symptoms disappear completely even when they avoid FODMAP foods 24/7. So how do you know if the food you’re testing is causing symptoms or if it’s something else entirely? The answer is that you’ll figure it out as you go. Just like you identified IBS culprits and learned to manage them when you first got started, you’ll see how your body reacts when high-FODMAP foods set you off. The only way to learn to ride a bike is to hop on and pedal. Same’s true for testing FODMAPs. The effort is worth it because of what you get in the end: You know what you CAN eat and what to avoid so you can stop policing every bite and start enjoying food again! The whole point of the FODMAP diet (the proven diet for managing IBS) is to give up food and feel better, right? Wrong. I know most of you don’t need to spend a week in a national park to feel freedom from food (But if that’s you, it’s totally do-able!). Most of you just want to go to a fun friend meal (preferably Mexican) without anxiety. That’s what my client Kate wanted. She knew just eliminating every possible IBS trigger wasn’t going to solve her problem - being able to eat and enjoy social meals. Read her Behind the Belly Story! Before Kate came to me, she eliminated FODMAPs and felt amazing, totally symptom free. But she knew she was in food prison (living on rice and rotisserie chicken and seriously missing her favorite Mexican food) and that had to end fast. As a crazy-busy high school math teacher taking on extra classes, she had zero time to become a FODMAP expert. Kate Sneed did 1-on-1 coaching with me starting in January. She lives in Denver, CO and in our first session this Denver Broncos super fan realized she’d signed on to work with a New England Patriots fan. Luckily, we hit it off anyway and got straight to business! Kate’s “Screw this!” moment happened at a tailgate party when some tasty chips and salsa sent her belly into a tailspin and she had to do the mad port-a-potty dash. She had no clue if it was A) the onions, B) the garlic, C) the tomatoes, or D) something else going on in her gut that triggered this awkward moment. She knew she needed to learn more about her body before she’d be free to eat without fear. Kate not only tested all the FODMAP groups, she also satisfied her food cravings for pulled pork and homemade brownies by trying the new recipes I gave her. She even had a great time on a girls’ wine tasting weekend without any major symptoms. Let’s hear the scoop from Kate! Julie: Where were you in the FODMAP diet process when you started working with me? Kate: I had been doing elimination for a little over a month. I was not having any symptoms and ready to figure out what was causing issues a month earlier. Julie: What made you decide to work with a FODMAP coach? Kate: Your blog and website provided me with so much information when I was researching FODMAPs. Also that it didn’t matter that you were not in my town! Julie: What are one or two surprising things you learned? Kate: That honey is not my trigger but that onion and garlic could have such a nasty effect on people- who knew! Also that sugar can be stored in so many different types and that my body can react differently to each one! Julie: Did coaching make the FODMAP Diet easier? Tell us how. Kate: So much easier- I was overwhelmed by how to reintroduce and the portion size and how to increase the amount of something, etc. The weekly plans made it so easy to just pick up a certain food at the store and know how much of it to try and what to do based on what happened! I didn’t have the time to spend hours researching or figuring it out from different books or websites. Julie: Now that you're done with coaching, how is your life different? Kate: I feel so much more confident about eating out or with friends. I know what to expect- before I had no idea what meal would set me off and what wouldn’t- it was an experiment every time. Now I know if I decide to eat something at a meal that is a trigger that I will have a reaction and I can make the choice instead of waiting to find out! Kate got the results she wanted from her time together with me and you can too! I read health and fitness magazines for new workout ideas, but my favorite articles are always the reader success stories. Workout advice is great, but I gain so much more insight from seeing that Jane Jones from Seattle does 30 minutes of interval training 3 times a week. That’s why I’m so excited to share the success story of one of my FODMAP Coaching clients with you! Her story shows what life ACTUALLY looks like when you reintroduce FODMAPs, even with a lot of work and life commitments. AND that you don’t have to eat a boring, depressing diet (kale and rice I’m looking at you). Suzy tried new saucy Asian stir fries and experimented with polenta so she never got bored. But that's getting ahead of ourselves! Suzy did my Reintroduction Roadtrip 1-on-1 coaching program earlier this year. For 6 months, she’d been living on mostly water and air (okay, it was more like basic salads with olive oil and lemon) in the elimination phase. She loved not being bloated and constipated, but knew she couldn’t go on like this forever. She wanted to get back to cooking meals both she AND her husband wanted to eat. Read her Behind the Belly story! Suzy Remmert lives near Austin, Texas, and works in a salon/boutique. Suzy was in the middle of training for a half marathon with her husband. It was going to be her first one, and she and needed her belly to be calm and fueled up not only for training, but for race day! Combine her high-protein needs with her limited food groups and she stuck in an unappetizing rut. Being stuck in the elimination phase didn’t feel like much of a win, but Suzy didn’t have hours or days to spend becoming an expert on the reintro phase. And she definitely didn’t want to jeopardize all the race training she was doing. Finally figure out what foods were making her bloated and constipated. Be able to have fun at social events and enjoy her workouts without feeling like crap. Go out to dinner and enjoy it fully since she knows what and how much to eat. Let’s hear the scoop from Suzy! Suzy: I had been doing the elimination diet for 6 months, feeling frustrated and so defeated and alone. Suzy: I had seen several dietitians and none of them were knowledgeable with the FODMAP diet or had been able to help me at all. I was literally at my wits end. Julie: What did you hope to accomplish through coaching? Suzy: To find out how to reintroduce foods correctly with as little discomfort as possible. Also, to get more recipes and have more selections and not feel so deprived. Julie: How did coaching make the reintroduction process easier? Suzy: By walking me through step by step and explaining the process. Also, I would not have known that after testing a food and having no symptoms that I still needed to keep it out of my diet till I was completely done with reintroduction. Suzy: I feel so much better tummy wise, but also emotionally. I feel more confident with my food choices, and that I do have control in feeling better. I have a ton of recipes to chose from and I feel more confident in the kitchen. Julie: What would you say to anyone considering coaching? Suzy: I definitely think [FODMAP] coaching is worth every penny. The Fodmap diet is extremely confusing and overwhelming, having someone that understood it and was able to guide and educate me through it made all the difference in the world. Suzy got the exact results she wanted from her time together with me and you can too. It doesn’t matter if you’re a foodie who loves Italian or a Triathlete who needs protein, I’ll make sure you, your belly, and your kitchen are all working together. Learn what FODMAPs trigger your symptoms and in what portions so you can go back to eating the ones that don’t. Eat at restaurants and social events without monitoring the distance between you and a bathroom at all times. Stop spending a fortune on “special” food because everything else contain “less than 2% natural flavors” (translation: probably garlic). Be able to travel to exotic places and eat on the road without stress (and if you’ll be traveling during the reintro phase, we can make that work!). Last week, I busted myths about reintroducing FODMAPs, and now it's time go deeper on this topic. The only way to find out what foods trigger your IBS is careful reintroduction. But how do you REALLY know you're ready? It’s essential to figure this out so you’ll know when to take the leap. The most important sign you're ready to reintroduce FODMAPs is that you've experienced consistent improvement in your symptoms by doing the elimination phase. But sometimes you need a little more info to go on! So I came up with 5 signs that show it's time to test FODMAPs. Knowing what foods trigger your IBS and which ones don't makes life so much more delicious. Your belly feels good, but you’re not happy (spending 8 months in the elimination phase has officially sucked the joy out of your life). You’re mad at yourself for spending a small fortune on low-FODMAP crackers and bars again because you suspect that a little bit of wheat (or milk/honey/onion powder) will NOT actually turn your belly into an angry, raging fire. You went to a new restaurant with a really creative menu and spent $24 on a plain grilled chicken salad (special request, of course). You just booked a week in Mexico and feel stuck between A) Totally depriving yourself on the elimination phase, and B) Eating ALL THE THINGS and getting diarrhea at the beach. You really miss fresh figs or [insert food of YOUR dreams here]. You owe it to yourself to find out if you and your dream food can kiss and make up. If these signs sound oddly specific, that’s because I experienced them all myself. The biggest thing I found? Traveling and eating low-FODMAP can be excruciatingly hard, especially if you're a foodie. Luckily, I’ve got something that will help you put pizza and pad thai and tapas back on your radar, not banished for all time. Trying to piece together your own reintroduction plan feels like swinging at a piñata blindfolded-- you're just stumbling around in the dark. Different websites have different rules...Which ones are actually important? If you want to do this phase at your own pace and a done-for-you plan to find your IBS triggers, Free To Eat is the solution you've been looking for. Our Free To Eat program, plus monthly trainings, Q&A calls, and community support are available to all members of Calm Belly Club. Join today for only $12.99 per month, cancel anytime. Click to learn more about Calm Belly Club!